Kelly Saldaña, Director of the Office of Health Systems at USAID, presented the 2017 Acting on the Call report at the Palladium DC office on August 8th, at a briefing organized by Elena Ateva, Maternal and Newborn Health Policy and Advocacy Advisor, and Betsy McCallon, CEO, at HP+ partner the White Ribbon Alliance. 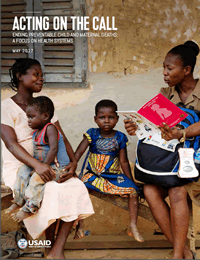 The 2017 report lays out how health systems strengthening (HSS) contributes to maternal and child survival goals. This new report presents two-page spreads for each of 25 priority countries. An index based on a set of three indicators – out-of-pocket payments, density of human resources for health (HRH), and governance and accountability – is used to characterize the relative strength of the health system in each country. Attendees in person and online were able to ask questions and engage with Kelly Saldaña and special guest Mary Ellen Stanton, Senior Maternal Health Advisor at USAID. This Q&A portion moderated by Jay Gribble, HP+ Deputy Director for FP/RH, covered a series of topics from impact evaluation to multi-sectoral engagement and governance. A key takeaway was that HSS should not be seen as siloed into the six HSS building blocks. Rather, it is the interdependence of the building blocks that supports strong health systems. A systems thinking approach is critical – starting with identification of the problem and then working backwards to understand the key bottlenecks to the issue and then arrive at appropriate solutions. Something to Build On: HEPP's "Innovation Exchange"